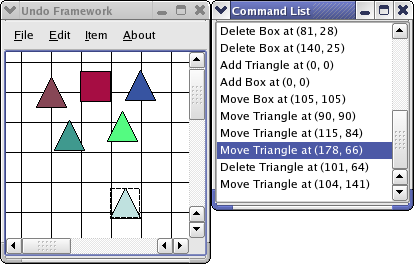 In the constructor, we set up the DiagramScene and QGraphicsView. The createActions() function sets up all the examples actions in the manner shown above. The createUndoAction() and createRedoAction() helps us crate actions that are disabled and enabled based on the state of the stack. Also, the text of the action will be updated automatically based on the text() of the undo commands. For the other actions we have implemented slots in the MainWindow class. We have to use the QMenu aboutToShow() and aboutToHide() signals since we only want deleteAction to be enabled when we have selected an item. We implement itemMenuAboutToShow() and itemMenuAboutToHide() to get a dynamic item menu. These slots are connected to the aboutToShow() and aboutToHide() signals. We need this to disable or enable the deleteAction. undo() removes the item from the scene.